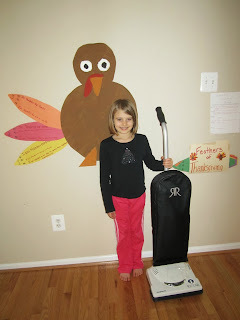 Feeding Our Lives, LLC: Riccar Supralitet RSL1A Review: The Best Vacuum EVER! Riccar Supralitet RSL1A Review: The Best Vacuum EVER! I bought a new vacuum, and I LOVE it!!!! The Backstory: 5 years ago, we needed a new vacuum. We followed Consumer Reports' suggestion and bought the Eureka Boss. We hated it. The hose broke and had to be duct taped. The suction was lost. The stair-doo-hickey stopped working. But, honestly, since I rarely vacuumed since it was too heavy for me, I really never had to deal with its short-comings. The Now Story: I made a mess in the basement sewing millet pillows (I'll get to that in another post). There was thread all over the floor. Feeling industrious, I lugged out the vacuum, and vacuumed the whole basement! I felt so proud of myself. Until later that night we went to the basement to sit on the floor to play a family game. It was then that I saw thread pushed into the carpet and dog hair from when a friend had visited - two vacuum sessions ago! Oh. My. Goodness. This vacuum meets all those criteria PERFECTLY, and it was way under budget! I've had it for a few days now, and I'm still impressed with it each time I use it. And my husband is impressed that I've used the vacuum several times! 1. Within three minutes of my first use of the vacuum, I accidentally sucked up a rope of some sort. I quickly turned it off, panicked for a moment, sat on the floor, popped off the under-cover, snapped out the roller bar, took off the belt, pulled out the rope, put the belt back on the roller bar, popped the roller bar back in, popped on the under-cover, and started vacuuming again. MIRACLE!!!!! 2. Today, I accidentally knocked a big plate of brown dirt all over the carpet. Sigh. In the past, I probably would have debated whether or not to wait for my husband to come home to deal with it or take care of it myself. With my new vacuum, my daughter offered to go get it for me (seriously), and I pushed the vacuum over the spot once with spick-and-span results. Not believing one push was enough, I did it again for good measure. You would never know I dumped dirt up there. After hearing my criteria was met, my mom decided to go out and buy this vacuum. She is equally impressed with it! If you're considering this vacuum, I highly recommend you bite the bullet and buy it! You won't regret it! For those of you worried about no attachments, get a little Eureka Banana for $20 and use it when you need it. You do NOT need attachments for the stairs with this vacuum. By the way, this is the entry level Riccar Supralight. If you want more speeds, stainless steel roller bar, lifetime belt guarantees, ergonomic handle, etc, they have versions that go all the way up to $700. I have never heard of this brand of vacuum cleaner but I will be sure to check it out!